Richard Mather was born on 22 December 1712 at Lyme, New London Co., CT. He was the son of Samuel Mather and Deborah Champion. Richard Mather married Deborah Ely on 18 May 1742 at Lyme, New London Co., CT. Richard Mather died on 11 January 1790 at Lyme, New London Co., CT, at age 77. Alma Holcombe was born circa 1844 at PA. She was the daughter of Luman Holcombe and Achsah Sanders. Lyman Rundell was the son of Edgard Rundell and Frances E. Holcombe. Lena Rundell was the daughter of Edgard Rundell and Frances E. Holcombe. [S25] Hannah McPherson, Holcombe Genealogy, Page 133.2/Item A-8-1-2-9-5-4-1-2. Submit Holcombe was born on 2 August 1772. She was the daughter of Noah Holcombe and Jerusha Buttolph. Submit Holcombe married Simeon Phelps at Rutland Co., VT. Submit Holcombe died on 9 March 1851 at Tinmouth, Rutland Co., VT, at age 78. Although one source shows Submit dying in VT. there is a stone in the Penn Line Cemetery, Crawford Co. PA, that show her family. [S25] Hannah McPherson, Holcombe Genealogy, Page 212.1/Item A-8-4-4-6-1. Laomi was enumerated in the 1800 Rupert, Bennington Co., VT, federal census with a family of: males 3 under 10, 1 26-45; 1 female 26-45. Noah was next door. Laomi was enumerated in the 1820 Harrisville, Median Co., OH, federal census. The household was males: under 10 3, 10-16 2, 26-45 1; females: under 10 1, 26-45 1, 45 and up 1. Noah and Levi were enumerated nearby. Laomi was enumerated in the 1830 Carlisle (LaGrange), Lorain Co., OH, federal census, enumerated adjacent to Noah Holcombe Jr. and Laomi Holcombe Jr. Laomi's household consisted of males: under 5 2, 5-10 2, 10-15 2, 15-20 1, 30-40 1, 50-60 1; females: 5-10 1, 30-40 1. Hannah was enumerated in the 1850 Harrisville, Medina Co., OH, federal census. She was 63. Also in the household was son Oviatt, 20, Emily 13, the daughter of Jonathan, and Harrison 10, the son of Jonathan. Oldest Deed Book, Medina County transcribed by Sunny AMBROSE. From Hannah HOLCOMB to D. MERRY 21 Apr 1855. 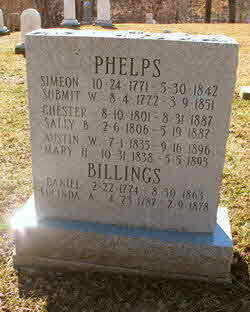 Simeon Phelps was born on 4 October 1771 at Lebanon, New London Co., CT. He married Submit Holcombe, daughter of Noah Holcombe and Jerusha Buttolph, at Rutland Co., VT. Simeon Phelps died on 30 May 1842 at Penn Line, PA, at age 70. Joseph Phelps was born on 11 June 1741 at Turkey Hills, Hartford Co., CT. He was the son of Ensign Joseph Phelps and Deborah Holcombe. [S25] Hannah McPherson, Holcombe Genealogy, Page 122.2. [S135] Judge Oliver Seymour Phelps Phelps Family, Vol. I:Pg. 193/Item 1072. Harvey Phelps was born in 1743 at Turkey Hills, Hartford Co., CT. He was the son of Ensign Joseph Phelps and Deborah Holcombe. [S135] Judge Oliver Seymour Phelps Phelps Family, Vol. I:Pg. 193/Item 1073. Roswell Phelps was born on 22 March 1744 at Turkey Hills, Hartford Co., CT. He was the son of Ensign Joseph Phelps and Deborah Holcombe. Roswell Phelps died on 18 May 1752 at Turkey Hills, Hartford Co., CT, at age 8. [S135] Judge Oliver Seymour Phelps Phelps Family, Vol. I:Pg. 193/Item 1074. Roger Phelps was born on 22 February 1746 at Turkey Hills, Hartford Co., CT. He was the son of Ensign Joseph Phelps and Deborah Holcombe. [S135] Judge Oliver Seymour Phelps Phelps Family, Vol. I:Pg 193/Item 1075. Deborah Phelps was born on 30 April 1750 at Turkey Hills, Hartford Co., CT. She was the daughter of Ensign Joseph Phelps and Deborah Holcombe. Deborah Phelps died on 16 May 1750 at Turkey Hills, Hartford Co., CT.
[S135] Judge Oliver Seymour Phelps Phelps Family, Vol. I:Pg. 193/Item 1076. Jabez Phelps was born in 1751 at Turkey Hills, Hartford Co., CT. He was the son of Ensign Joseph Phelps and Deborah Holcombe. Jabez Phelps died on 28 May 1752 at Turkey Hills, Hartford Co., CT.
Luman E. Holcombe was born say 1829-1830 at CT. He was the son of Luman Holcombe and Harriett Newell. Henry L. Holcombe was born say 1831-32 at CT. He was the son of Luman Holcombe and Harriett Newell. Alice M. Holcombe was born on 15 May 1848 at New Britain, Hartford Co., CT. She was the daughter of Luman Holcombe and Harriett Newell. Clifford McCullough was born circa 1865 at NY. He was the son of Charles McCullough and Pluma Amanda Holcombe. Hugh McCullough was born circa 1871 at NY. He was the son of Charles McCullough and Pluma Amanda Holcombe. Roy C. McCullough was born in March 1879 at NY. He was the son of Charles McCullough and Pluma Amanda Holcombe. Percy Merrill was born on 24 December 1781 at New Hartford, Litchfield Co., CT. She married Thomas Barber, son of Jacob Barber and Patience Lawrence, on 15 November 1797. Percy Merrill died on 19 May 1847 at Nelson, Portage Co., OH, at age 65. Mary Ann Barber was born on 3 September 1822 at Portage Co., OH. She was the daughter of Thomas Barber and Percy Merrill. Mary Ann Barber married Ashbel Holcombe, son of Asahel Holcombe and Lucy Holcombe, on 5 March 1842. [S169] M.D. Donald S. Barber, Thomas Barber 1st Ed, Page 157. Arden Jay Holcombe was also known as Jay Holcombe. He was born say 1805 at Granby, Hartford Co., CT. He was the son of Arden J. Holcombe and Rachel Hoskins. Arden Jay Holcombe married Clarissa Holcombe. Arden Jay Holcombe died on 4 December 1886. Jay is recorded in the 1850 Granby Hartford Co., CT census. Lorna (sister Lorenda) was listed as head in this census and Clarissa was listed last in the family. [S25] Hannah McPherson, Holcombe Genealogy, Page 190.2/Item A-8-1-10-10-2-1. Eugene John Pritchard was born on 13 September 1908 at Madison, Greenwood Co., KS. He was the son of Braton Harlow Pritchard and Jessie May Newman. Eugene John Pritchard married Beulah Alice Mansell. Eugene John Pritchard died on 22 August 1988 at Santa Paula, Ventura Co., CA, at age 79. It was apparently Lorenda, listed as "Lorna", living with brother Jay in the 1850 census. Lorenda Holcombe was born say 1808-1809 at Granby, Hartford Co., CT. She was the daughter of Arden J. Holcombe and Rachel Hoskins. [S807] Find A Grave, online http://www.findagrave.com, memorial #187544984. How sudden was the fatal stroke, When the Lord his summons spoke. McPherson lists descendants of Chester Reuben Holcombe, however, starting 4 generations later with no explanation of the intervening families in these pages, however, she jumps to page 799.2 to continue the family. As a young man Chester "was acknowledged as the champion wrestler of New England". He moved to Muscatine, Muscatne Co., IA. Chester Reuben Holcombe was born on 22 May 1814 at Granby, Hartford Co., CT. He was the son of Arden J. Holcombe and Rachel Hoskins. Chester Reuben Holcombe married Adoline Spencer, daughter of Harry Spencer and Betsey Weed, on 28 October 1835 at Granby, Hartford Co., CT. Chester Reuben Holcombe died on 19 July 1874 at Muscatine, Muscatine Co, IA, at age 60. [S25] Hannah McPherson, Holcombe Genealogy, Page 799.1/Item A-8-1-10-10-2-6. Irene Holcombe was born at Granby, Hartford Co., CT. She was the daughter of Arden J. Holcombe and Rachel Hoskins. Asahel Holcombe was born at Granby, Hartford Co., CT. He was the son of Arden J. Holcombe and Rachel Hoskins. Frederick Julius Holcombe was born on 21 December 1825 at Granby, Hartford Co., CT.1 He was the son of Arden J. Holcombe and Rachel Hoskins. 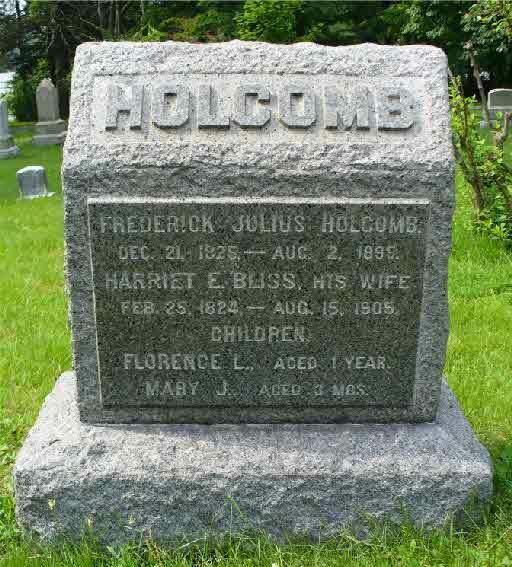 Frederick Julius Holcombe married Harriet E. Bliss on 27 November 1854. Frederick Julius Holcombe died on 2 August 1895 at West Granby, Hartford Co., CT, at age 69, and was buried on 5 August 1895 at Cedar Hill Cemetery, Hartford, Hartford Co., CT. There is yet no evidence that this Frederick Julius Holcombe is the son of Arden. Frederick T. Holcomb of this city died at the home of his niece, Miss Mary Holcomb, in West Granby yesterday, aged 71 years. Mr. Holcomb was in early life a master builder and was a contractor for building depots and bridges on the old Hartford Providence & Fishkill Railroad. He has not been able to attend to business for some years past and has made his home with F. E. Bliss, a nephew, on Sigourney street. He had gone to the old homestead, where he was born, in West Granby, for a visit and died from an attack of heart disease, to which he was subject. His funeral will be held Monday at 1 o'clock at Cedar Hill Cemetery. He leaves a widow and one daughter, Mrs. William Peck of Chicopee, Mass. The niece mentioned above is probably Mary Ann Holcombe, daughter of Frederick's brother Arden. Harriet was enumerated in the household of her son-in-law, William Peck, in the 1900 Chicopee, Hampden Co., MA, federal census. She was 76. [S807] Find A Grave, online http://www.findagrave.com, memorial # 14786205. Rachel Holcombe was born at Granby, Hartford Co., CT. She was the daughter of Arden J. Holcombe and Rachel Hoskins. William Holcombe was born on 2 November 1835 at CT.1 He was the son of Arden Jay Holcombe and Clarissa Holcombe. William Holcombe died on 9 April 1900 at age 64; unmarried, la grippe.1 He was buried at West Granby Cemetery, Granby, Hartford Co., CT.
[S419] Carol Laun, Beneath These Stones, Page 119. Mary Ann Holcombe was born in June 1846 at CT. She was the daughter of Arden Jay Holcombe and Clarissa Holcombe. Mary Ann was enumerated in the 1900 Granby, Hartford Co., CT, federal census. She was a farmer age 53. Cousin Almeda P. Holcombe, age 59, a widow, was also in the household. Adoline Spencer was born in 1816 at Granby, Hartford Co., CT. She was the daughter of Harry Spencer and Betsey Weed. Adoline Spencer married Chester Reuben Holcombe, son of Arden J. Holcombe and Rachel Hoskins, on 28 October 1835 at Granby, Hartford Co., CT. Adoline Spencer died in 1906. Betsey Weed was born in 1790 at Granby, Hartford Co., CT.
Melissa J. Holcombe was born on 14 November 1837 at Nelson, Portage Co., OH. She was the daughter of Chester Reuben Holcombe and Adoline Spencer. Melissa J. Holcombe died on 31 May 1863 at Muscatine, Muscatine Co, IA, at age 25. [S25] Hannah McPherson, Holcombe Genealogy, Page 799.1/Item A-8-1-10-10-2-6-1. Francis was ordained in Iowa in 1878 as a minister of the Methodist Episcopal Church and served as pastor of circuits in Southern and Eastern Iowa and as Clerk of the Board of Trustees of Blomington Twp., Muscatine Co., IA. He moved in 1888 to Fullerton, Orange Co., CA, where he organized a Methodist church of 11 members, now grown to nearly 1,000 members having a building covering a block and costing $150,000. He served this church and churches at Anaheim and Garden Grove, both also in Orange Co., CA, for five years. Retired before 1911; became a horticulturist on 30 acres near Fullerton, planting 8 acres in oranges and other acres in English walnuts and asparagus, on all of which he succeeded. He served as director of the First National Bank and of Saving Bank, Fullerton. and as a member of the Advisory Board of Security First Natinal Bank, Los Angeles, CA. Francis Reuben Holcombe was born on 14 June 1841 at Windham, Portage Co., OH. He was the son of Chester Reuben Holcombe and Adoline Spencer. Francis Reuben Holcombe married Annie Love Johnson, daughter of Ezra Johnson and Sarah Hoskins, on 7 May 1866. Francis Reuben Holcombe married Elizabeth Hazelton in 1877. Francis Reuben Holcombe died on 9 October 1930 at age 89. [S25] Hannah McPherson, Holcombe Genealogy, Page 799.1/Item A-8-1-10-10-2-6-2. Betsy A. Holcombe died at Home of son Albert, Burlington, Des Moines Co., IA. She was born on 4 May 1848 at Muscatine, Muscatine Co, IA. She was the daughter of Chester Reuben Holcombe and Adoline Spencer. [S25] Hannah McPherson, Holcombe Genealogy, Page 799.2/Item A-8-1-10-10-2-6-3.